Denpasar: the capital city of Bali retains its unique Balinese personality and community feeling amongst its modern centre of government, international banks and economic development. Denpasar is a hive of cultural activity and as you get off your Denpasar flight , you'll discover that your Denpasar hotel will be located close to many attractions. Visit the Pura Jagatnatha, a temple dedicated to Bali’s supreme God, Sang Hyang Widi. The shrine consists of an empty throne on top of a cosmic turtle and two nagas - mythical serpents - signifying the foundation of the world. The Bali Museum has a comprehensive collection of artefacts and records of Balinese history. Benoa Harbour is the hub of marine activity and home to many yachting races. Enjoy a boat cruise on the blue waters around Bali’s archipelago, or charter a yacht for holiday of sailing, fishing, scuba diving or surfing. Take a white-water rafting tour on the Melangit River and explore the beautiful scenery located only an hour from Denpasar. 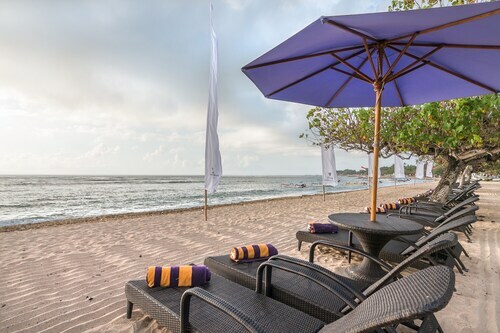 Or relax in the sunshine on Sanur Beach, the closest beach to Denpasar, with its calm waters, where looking to the Southeast you can see Nusa Penida Islands and looking to the East panoramic views of South Bali and its stunning mountain ranges. Denpasar has lots of choices for shoppers such as traditional markets, night markets and shopping complexes. Our hotels in Denpasar are centrally located close to the activity. In Denpasar you’ll find paintings, handcrafted statues, cottons and silks, ceramics and many other local handmade goods. The largest and oldest market is Badung, providing fresh produce, clothes, textiles, fabrics and household supplies. Kumbasari markets are full of woven bamboo kitchen crafts, spices, dried goods, and Balinese textiles. Visit a warung (local cafe) and enjoy a wide variety of fantastic Indonesian cuisine. Browse through our list of popular Bali hotels for your beach hotel outside of Denpasar. How Much is a Hotel Room in Denpasar? 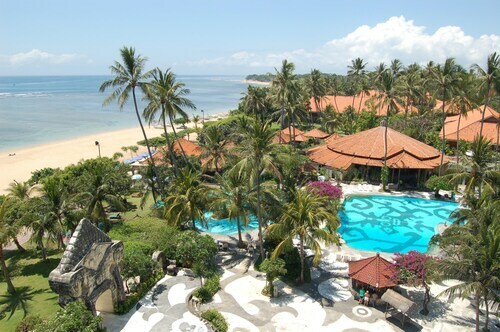 Hotels in Denpasar start at AU$41 per night. Prices and availability subject to change. Additional terms may apply. Fabulous hotel, right on the beach . Beautiful pool area with swim up bar and large double bed chairs which gives it a more glamouress appeal. We paid for the Club rooms, with an adult only pool. However , this area had no waiter service nor big beds and minimal beds with shade which is essential for myself. It was a ridiculous fight to get a poolbed with a shade each day . Club room was nice but dated. None of the elegant bathrooms that Bali is famous for, and the huge four poster bed went out of favour when it gave us both major hip pain by mid week. Staff are plentiful and extremely pleasant but the wait staff are pretty useless. Who knows whether you’ll ever get milk with your coffee, or how many people it will take ? Lovely people but the dining staff just lack focus. A suggestion : maybe each wait person should get their own area of tables to attend? Hotel food/ bar was good but the most expensive on the beach . Communal areas are kept spotless and the ground staff are diligent and polite.